Scopic Miniatur Barcelona is basically an amazing option for kids and adults alike. It is a place where kids can learn a lot through practical interactions and spend quality time with their parents. There is a lot to learn here with the help of models from different places. There is also a very real life-like model of the Catalonia railway station and also of Tokyo. These models have cars moving around, people hurrying to their destinations and a lot of other interesting features for you to witness. Basically, it is a must visit attraction if you want to offer your kid a completely different experience. 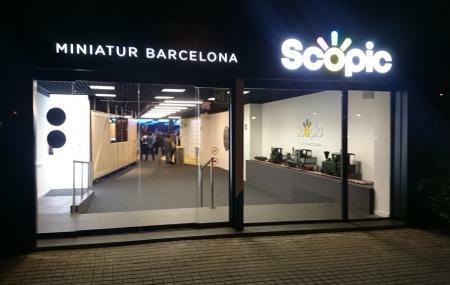 People normally also visit Jamon Experience while planning their trip to Scopic Miniatur Barcelona. Al entrar parece un sitio muy interesante y correcto. Luego vas viendo y, el trenecito tripulado funcionaba cada 30 minutos, la maqueta apenas tenía movimiento de trenes, exposición muy pobre, etc. Estaba pensado a lo grande pero no lo pudieron hacer. El sitio ha cerrado permanentemente y sin aviso.